I’ve written about Black Friday promotions at ING Direct (see note 1), Service Credit Union, and the growing Small Business Saturday event spearheaded by American Express (which even earned a tweet from Obama). This year I also noticed a trickle of activity on Cyber Monday as well. 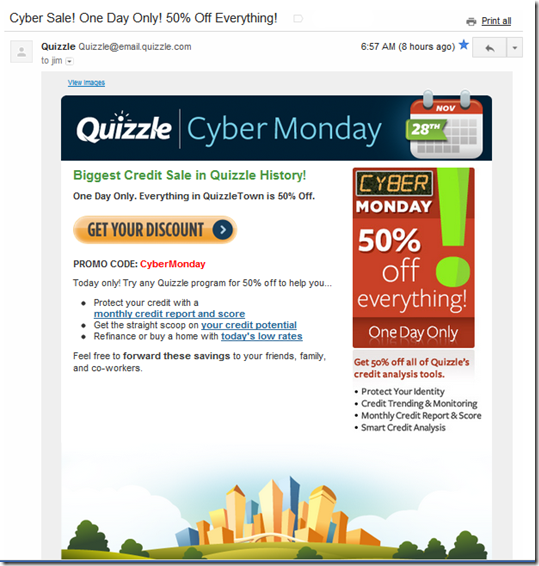 It’s probably better than Black Friday for online/mobile campaigns. 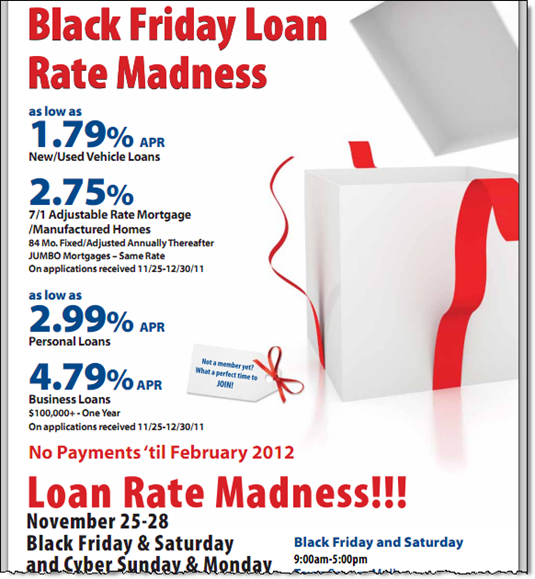 Better yet, use the approach of Visions FCU (screenshot 2 & 3) and use the entire weekend to maximize the impact. 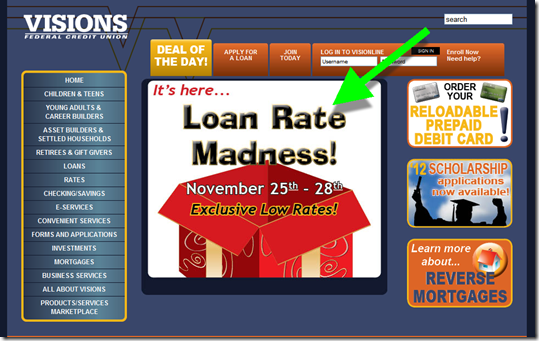 Visions Federal Credit Union offered a loan special from Black Friday through Cyber Monday (screenshot below). The CU reported $10 million in loans on Friday alone. Note: Given the date shown, this page is likely a carryover from 2010. But it’s still available via “Cyber Monday” searches on Navy Federal’s website. 1. ING Direct was at it again with seven offers over the Thanksgiving weekend (Deposit Accounts has the full rundown). However, the specials did not extend into Cyber Monday. Everyone likes the idea of an online PFM, but relatively few will take the time to enter the necessary account numbers and passwords. Fewer still will keep it running smoothly by coming back periodically to update passwords, provide security question responses, and so on. That friction means it’s not benefiting as many people as it could. 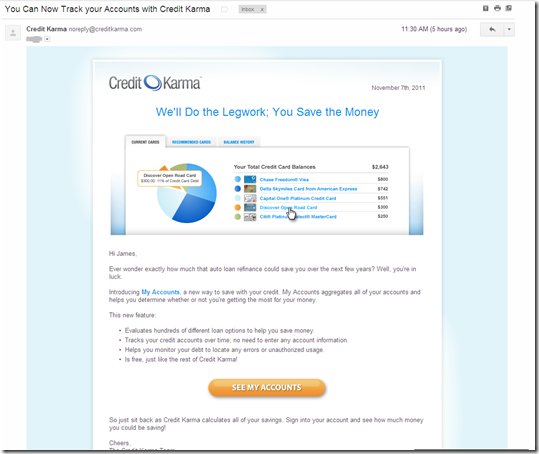 But Credit Karma removes the friction, at least on the credit side, with its latest feature, My Accounts (see first screenshot below; see fourth screenshot for today’s email announcement). The startup parses credit bureau data to automatically present each user with an aggregated look at their debt over time. The service requires ZERO account info from the user, they simply sign up with Credit Karma to get free credit report info. 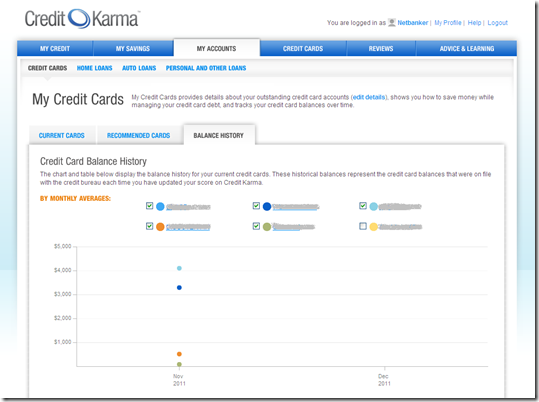 Historical data is captured each time the user updates their credit info at Credit Karma. Since it’s new, there’s just a single data point on my account (see second screenshot). 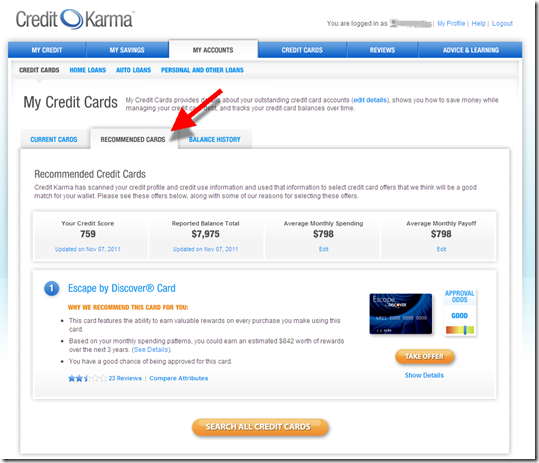 To earn advertising and referral income, Credit Karma integrates card offers into My Accounts with a Recommended Cards tab in the tertiary navigation (third screenshot). 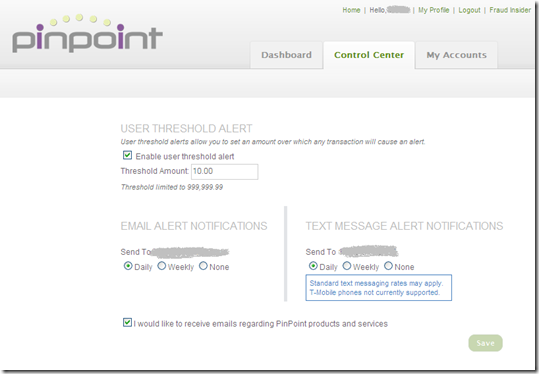 Cross selling is also woven into other areas as well (first screenshot). 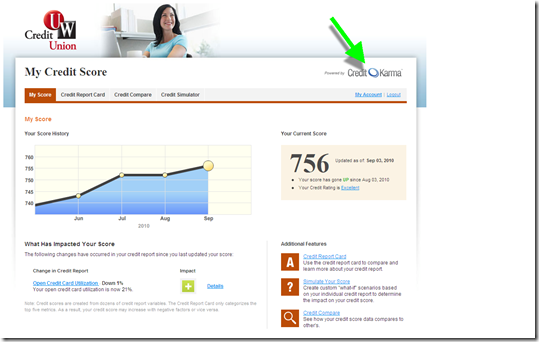 Credit Karma also covers home loans, auto loans, and personal loans. Each has their own tab in the secondary navigation. The company has 3.5 million registered users and is adding 500,000 every quarter. Bottom line: Keeping closer tabs on debt has huge benefits for many households. 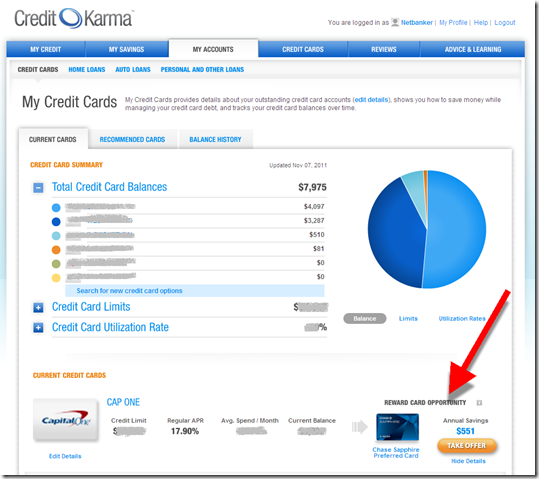 Credit Karma’s "no data input" method makes it easier. 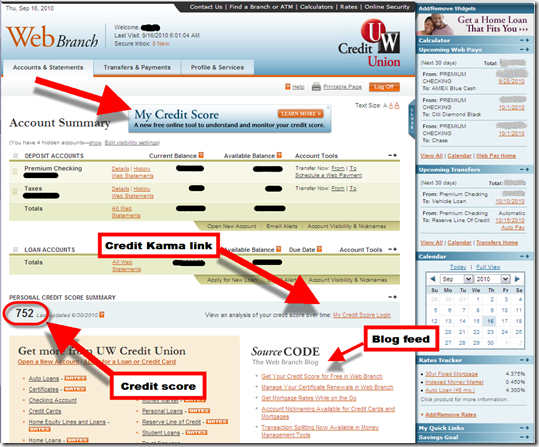 The last remaining hurdle is integrating the data into online banking so it’s not forgotten (see UW Credit Union post). Note: We’ve have written a number of reports on PFM and related issues in our subscription service, Online Banking Report. It figures. As soon as I write a report complaining about the dearth of online fee-based services, a major bank launches one, practically the same day. Both are good moves, but it’s the credit score service that’s especially novel. 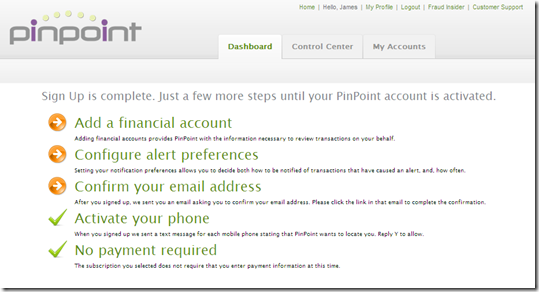 It’s integrated directly into online banking, so customers needn’t log in to another site to view their score. And the bank is charging for it, to the tune of $2.99 per month. There’s no mention of a free-trial period, but based on industry experience, that is likely to be one of the best marketing strategies available. 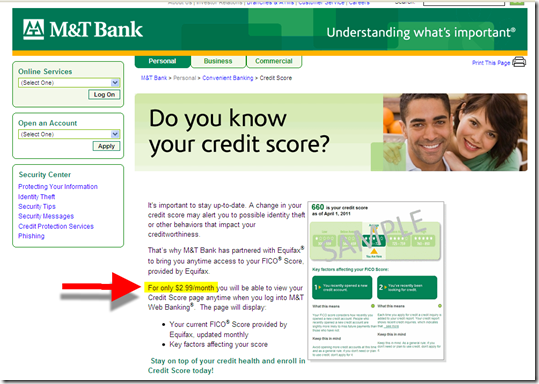 Given all the misleading advertising in the market (“free” credit scores that cost $15/mo), I’m pleased to see that M&T is upfront about the cost, mentioning it within the first 50 words of the landing page. With an aggressive promotional campaign, it seems possible the bank could eventually get 10% to 15% of its online base using it. Then M&T gets a dual benefit: a unique and powerful tool for its customers and $3.5 million in incremental gross revenues (if it hits 100,000 users). The bank can also upsell credit monitoring, credit scores for other family members, along with balance transfers and other credit products. 1. See our current Online Banking Report, Creating Fee-Based Online & Mobile Banking Services. 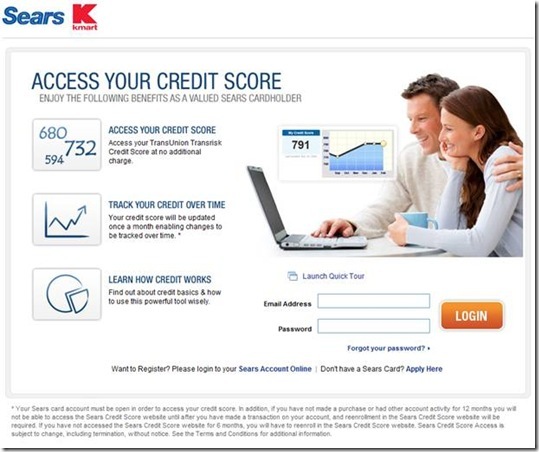 Finovate alum Credit Karma recently started providing a private-label version of its credit reporting service to Sears cardholders (see note 1). 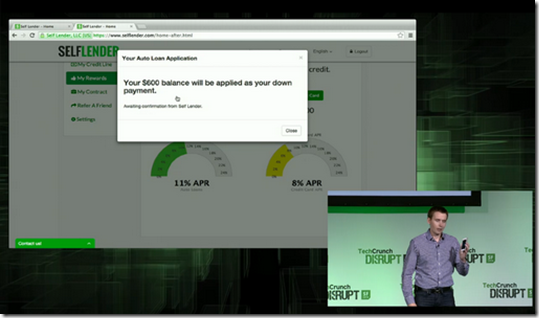 The service includes free credit scores and other data to help put those scores in an understandable context (see FinovateStartup 2009 video here). 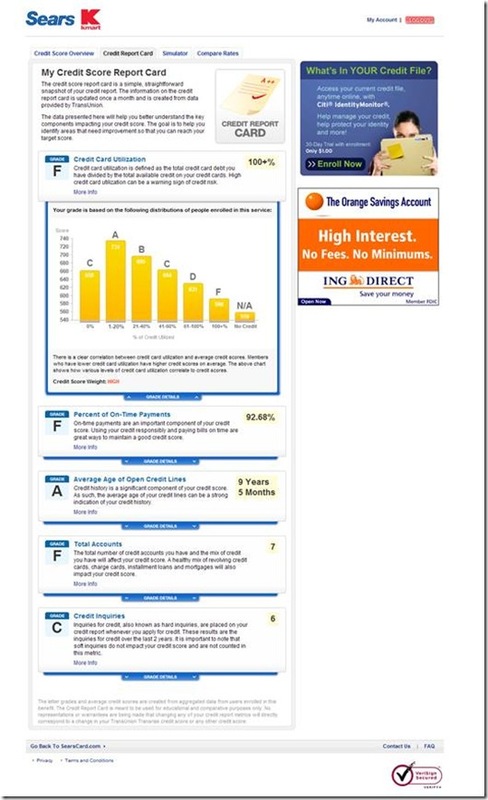 The new service, launched Sep. 2009, is delivered through a dedicated site, searscreditscore.com. 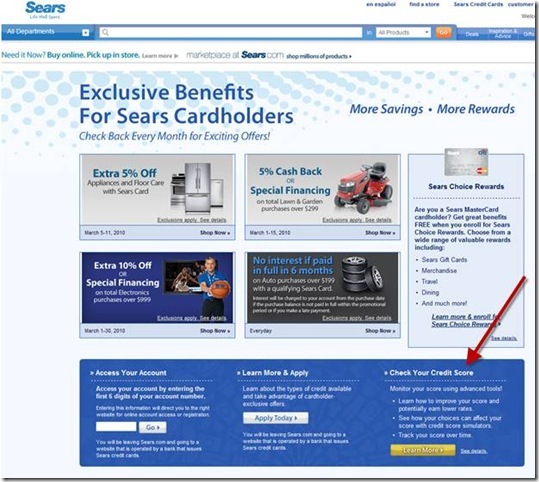 Since Sears cardholders must make a purchase each year to use the site, it provides an ongoing usage incentive. The Credit Karma-powered service is clearly branded as a Sears and Kmart offering (note 2, screenshot #1). Interestingly, Sears also takes the opportunity to offer targeted advertising space to financial companies (screenshot #3). 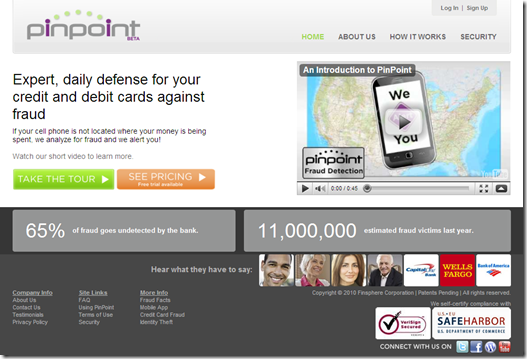 It also markets the credit-analysis service on its own credit card site (screenshot #2). While Credit Karma traditionally derived revenue from advertising on its site, this move into the private-label channel provides additional growth opportunities. The Sears private-label site had nearly 140,000 unique visitors in February, about one-third the total at Credit Karma (see table below). It’s a good deal for Sears, too: Offering credit-score analysis differentiates it from other retail card providers and conveys concern about its customers’ financial well-being. 1. Sears cards are issued by Citibank, one of the advertisers in the private-label site. 2. Kmart acquired Sears in 2004.